Lucky to have such thunderous weather! one of my most elegant cups. and the bouquets of summer flowers are vibrant in color! The gold trimmed edges look so gorgeous together! This sweet summer cup has a kidney shaped golden handle. ...and such a fabulous shape! Were you able to guess who manufactured it? May you August be even more Joy Full than July! Of course , pink is my favourite colour ..SO ..Please may I sip at teatime from this little charmer. Thanks for sharing. Oh, Terri, I love your pretty teacup! She's a beauty! Pink and posies are made for each other, aren't they? 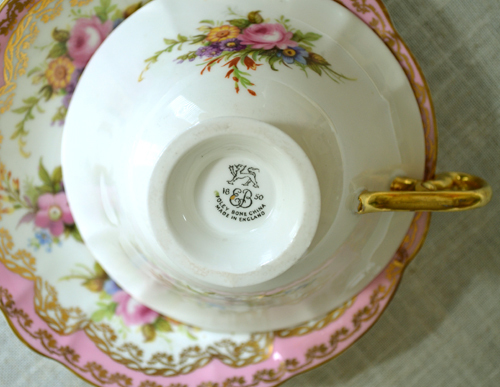 Thanks for sharing another lovely teacup with us. Hi Terri. That's a beauty, isn't it? Love the shape and pattern. So pretty! Thanks for hosting. It goes without saying this is an absolutely stunning set! Thankyou for showing us today. Hands down that is truly one of the most beautiful teacups I have ever laid eyes on - wow, it is GORGEOUS......I absolutely adore it. Foley was the name of my Godparents. I have sooo been out of the loop of late. I haven't even visited most of my favorite blogs! Yours being among my favorites! I am putting your blog button on my blog side bar so it will take me seconds to reach your blog easier. Oooo! Thunder and lightening! I love dark storms. It puts such atmosphere into the day or night, unless it gets out of hand, of course. Love the photos of the tea cups! I should participate some time. My camera has been obstinate lately and it has been very annoying especially trying to transfer photos to my files. Your teacup is a beauty! oh my, this cup makes me almost speachless. It is so very pretty. I love the colors and the golden trims. It would match so nicely to Sandi's Lady Carlyle and the Princess cup. Really a treasure. Thank you for sharing this wonderful photos and for hosting this sweet event. Oh, Terri, it's stunning this Foley tea cup! Everything in it is so charming! Your Foley teacup is absolutely gorgeous. I'm so in love. Delightful tea cup. I love the rose color and detail! Elegant indeed! What a seriously gorgeous cup. Sounds silly to say it takes my breath away perhaps but it did. GORGEOUS PINK!! I love this beautiful set. I can see why you chose this on a stormy day. The pink is calming and the flowers are cheery. The gold is delicate and the tea has to be sweet! Just like you. Thanks for hosting the tea party. I've had a lovely time. I posted about my TEA CUPS today! I'm down to collecting only white and gold or silver tea cups now...it's fun to collect tea cups...and I just cannot stop....I'm sure you know what I mean. 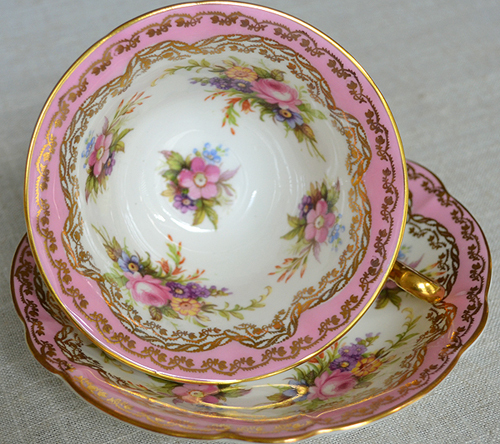 your beautiful pinks and floral tea cups will always hold a special place in my heart! I love your teacup too! 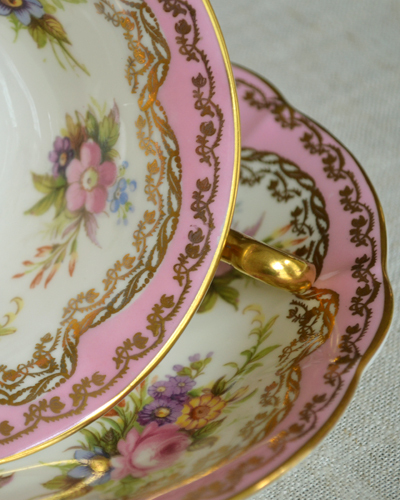 This cup is amazingly beautiful, both in the pink, -and the gold playes wonderfully up to that colour pink, and lovely bouquets on the plate and cup. This is my favorite teacup so far. I think she's just beautiful! That tea cup and saucer is beautiful, I love it, Foley does have some gorgeous pieces and that sure is one of them. Beautiful!! 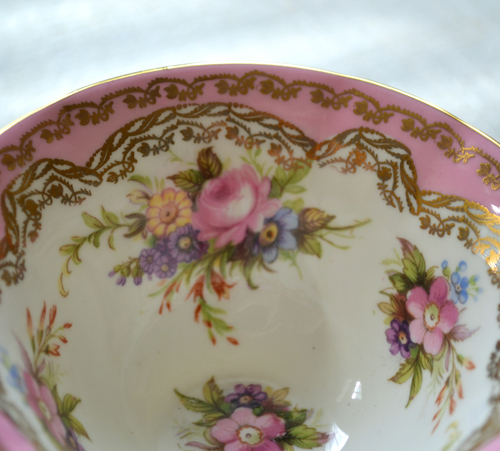 This is a scrumptious teacup!I love everything about it. You have the most beautiful teacups Terri. 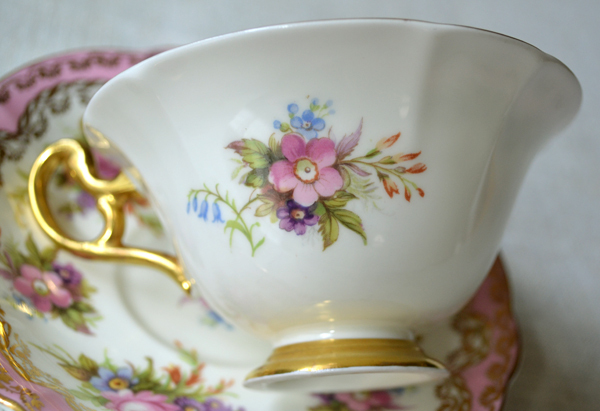 A stormy day is the perfect day to savor tea indoors , sipped from such a beautiful teacup. It must make your heart happy. What a beautiful cup you are sharing with us! It is perfect! There is just nothing like that around here to buy! Thank you for hosting your lovely party and have a wonderful rest of the week. Such a lovely teacup, Terri! I'm not joining as I don't have a post about cups these days but I'm enjoying visiting others. I am late to the party but better late than never so they say! Terri, love this cup, so dainty. The colors and blossoms on your cup are exquisite. I would like to see more of EB Foley. Wow..totally exquisite..such enchanting decadence...your photos spark my heart..beautiful set..totally magical! Wishing you a beautiful week ahead! When you will enjoy your cheap maternity wedding dresses hands on the bridal gown, evaluate the way in which wedding garment is at sound condition. 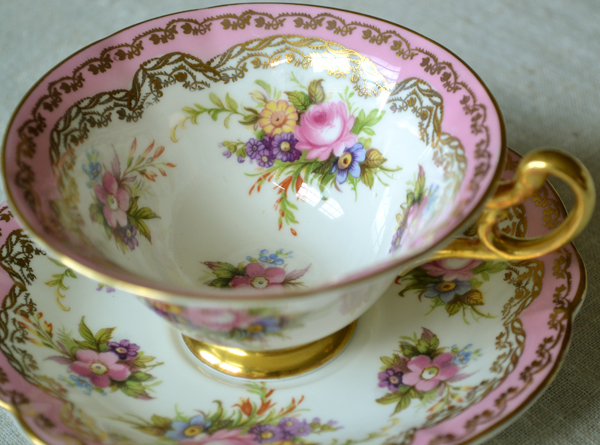 i love these beautiful tea cup, i want one. Your blog is just lovely, I enjoyed looking at all your tea cups, very, very pretty.